Recently GrassTex has come out with a superior backing like no other. Primary backing plays a vital role in the overall design of an artificial turf system. ArmorLoc™ 3L is non-directional, dimensionally stable and ensures no excess movement. Combined, ArmorLoc™ 3L with Silverback™ urethane coating and specialized yarns work together binding the DNA of all three components creating a thermoset bond. ArmorLok™ 3L has an extremely high tear strength. This strength provides the necessary proprieties that reduce the incidence of a rip or a tear in the product. This is due to the woven layers all working together like the tight weave of a basket or a carpet. ArmorLoc™ 3L is moisture and rot resistant. Other products that retain moisture present perfect conditions for rot over time. Pet owners love this feature! Less movement after the installation and over the life of the product. This improved stability addresses extreme temperature variations over the life of the product. Competitors take two backings and physically stitch them together when they tuft the product. This aftermarket fabrication method lessens the overall quality of the product. The two backings tend to move at different rates in the fabrication process leading to non-uniform product characteristics. 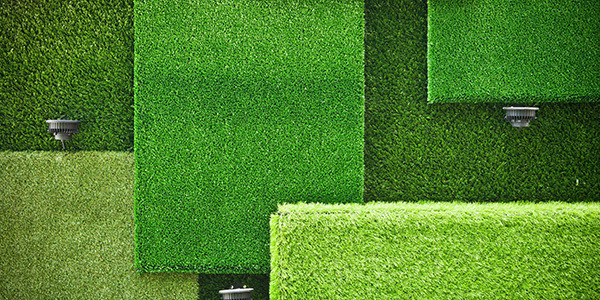 artificial grass, fake grass, grasstex, indoor facility, indoor training, landscape, Made in USA, pet, playground, synthetic turf. Can your lawn withstand Hurricane? GrassTex can!